If you’re a marketer today, chances are you’re thinking a lot about telling your brand’s story in an engaging and compelling way. Essentially, you’re thinking about content marketing – the art of telling your brand’s story to potential and current customers. Content marketing has been around as early as 1732 if not earlier, when Benjamin Franklin first published his annual Poor Richard’s Almanack to promote his printing business, and now in 2018, while the concept of content marketing has changed little, the ways in which brands can now execute their stories are seemingly limitless. According to the Content Marketing Institute, 70% of B2B marketers and 86% of B2C marketers surveyed use content marketing in some form or other. And it’s no surprise. If done well, an effective content marketing strategy can grow brand awareness, bring in new customers, drive revenue, and most importantly, help guarantee brand loyalty, conversions, and growth. We’ve looked at how three companies – Glossier, Harry’s, and Away – built loyal communities and fostered explosive growth with creative, engaging content strategies. The results of these content marketing efforts would make any content marketer envious, but if you’re just starting out, taking baby steps is fine, too. Companies that publish 16+ blog posts a month get as much as 3.5x as much traffic as those that publish 0-4 posts a month. Content marketing methods convert 6X more often than other marketing methods. Here’s how you can get started with a winning content marketing strategy today. Knowing what your goals will guide you and your team in other important decisions as you further refine your content marketing strategy. For instance, a common goal is to get people to come to your website or blog, and turn them into email subscribers. With their emails, you can build relationships with these people who are clearly interested in your content and hopefully, your product as well. For others, content marketing is about awareness of an issue or lifestyle that stands for something beyond a brand’s product. The idea is that a shopper, when aware of a brand’s mission or world, finds it appealing enough to eventually buy the products. 2. Know your audience. And talk to them in a way they’ll understand. A successful content marketing strategy always has two things in mind: your brand’s voice and the audience. If you’re trying to reach younger shoppers, you might want to reach them via social media with punchy language. But if you’re targeting older shoppers, your content may rely on building authority in the industry, instead. We can see that with Harry’s, for example, a company that sells razors but produces a digital magazine all about fathering, styling, and more. Tools like Google Analytics can help you measure which content is most popular among your audience and figure out who’s reading what, where, and when. Identifying who your content needs to target can help you figure out what topics and formats your content should feature. 3. Choose your content arsenal. Different target prefer different channels and types of content. Blogs – like Harry’s self-styled magazine – and email newsletters are often the core of any content marketing strategy. But innovative brands have gone much further, tapping into influencers on Instagram, building augmented reality campaigns for Facebook Messenger, running podcasts, printing physical magazines, producing video series, and more. It’s a valuable exercise to at the beginning of launching your content strategy to focus on one or two main channels and branch out later. As your brand’s audience grows and your content marketing efforts mature (along with your team and resources), you could even ask your audience what additional forms of content they’d love to see from your brand, such as podcasts or video. 4. Promote your content! And do so consistently. Okay, so now you’ve got all this great content in the pipeline. You’re posting to your blog three times a week, have plans to develop a bimonthly newsletter and a video series. How do you make sure people actually see your content? You can create great content but, like the proverbial tree that falls in the forest, if no one reads it, does it matter? An email newsletter is one of the most important modes of content distribution. 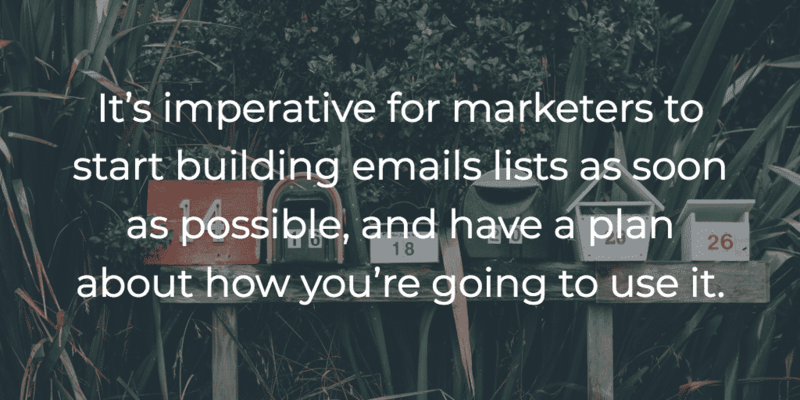 It’s imperative for marketers to start building emails lists as soon as possible, and have a plan about how you’re going to use it. First, you’ll need an email service provider (ESP) like Mailchimp, Campaign Monitor, or ConvertKit that allows you to build and maintain subscribers, send out emails, and see analytics on how your campaigns are performing. While you build up your email list, you can promote your content both on social media (paid and unpaid) and through your email newsletter, which you can use as a way to get your content bundled up and directly in front of your audience. Another important tactic is to make sure people can find your content through organic search. This involves doing keyword research and taking advantage of SEO to make sure your content promotes itself but is truly still valuable rather than just stuffed with keywords that improve ranking. The content that best does this is the evergreen content that anchors the other content in your blog and represents the core of your brand’s values and content strategy. Last, set up an editorial calendar. When you first start out, make sure the content you’re committed to producing is something you and your team can handle and keep up. Whether it’s one post a week or two posts per month or simply one robust email newsletter each quarter, make sure you execute consistently on schedule. Consistency, together with high quality, continuously published and refreshed content, can only reflect highly on your brand. Creating a long-term, engaging and rewarding content strategy is no easy feat but if done well with long and short term goals in mind, it’s certain to pay off. If it seems overwhelming, don’t forget that you’re not just adding to the noise and pushing another product – you’re a storyteller sharing your brand’s story that deserves to be heard. The tips in here are just the tip of a larger digital marketing iceberg. Learn more about how to reach the next generation of influential shoppers – Gen Z – by clicking on the button below!